Bringing you good news! My workshop is rescheduled to March 5, 2016. Due to unfortunate circumstances I had to cancel my workshop at the last minute. In this three hour workshop you'll learn how to carve four different types of stamps and helpful carving tips. There's a discounted workshop fee if you already have your own tools Php 1,500. First 8 registrants get a fun surprise from the gallery! Where will the workshop be at? Prism Gallery, Makati. Its a lovely art space in Salcedo Makati that's about one block away from Greenbelt 1. Here's the map. Leave a comment below or shoot me an email at info@marzren.com and I'll get back to you. 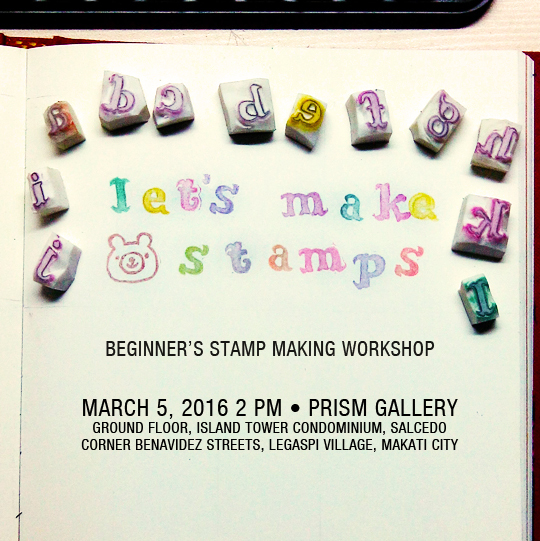 I am quite pleased with the first set of alphabet stamps I made especially for the promo photo for my workshop. I even gone the extra length to make a case for it. A special treat for my facebook fans, IG followers and blog readers. Not attending the workshop? 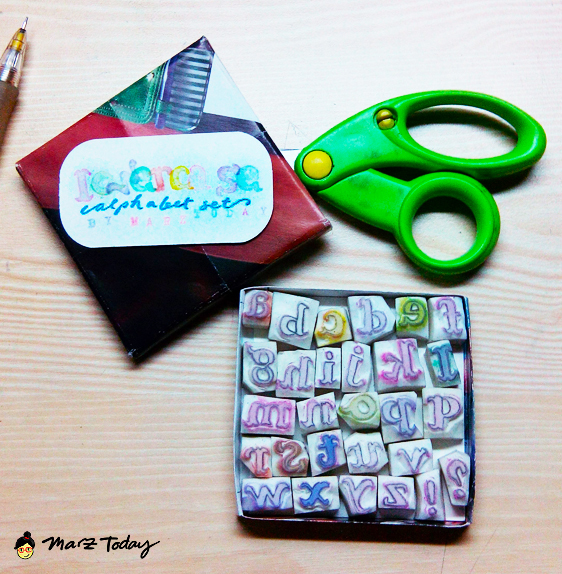 That's cool but if you help me get the word about my workshop out you get a chance win this one-of-a-kind lowercase stamp set. a.) Regram or repost my workshop poster with the hashtag #MarzTodayWorkshop on Instagram. b.) Tag Marz Today on your facebook post of the workshop poster. 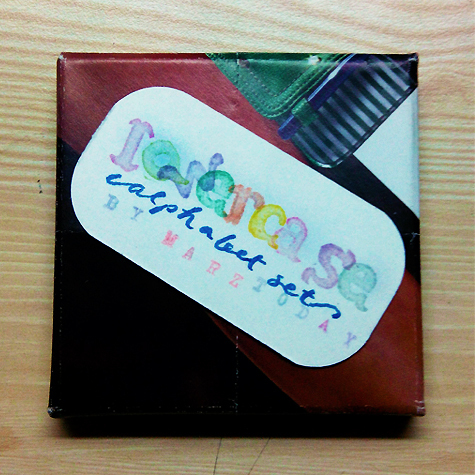 c.) Tweet my workshop poster with the hashtag #MarzTodayWorkshop on twitter. 3. Giveaway is open participants with a Metro Manila shipping address. If you happen to be from as far as Cotabato but have a Metro Manila address, GO FOR IT BUDDY! WIN THIS AWESOME SAUCE! The more regrams or shares of my workshop poster the more entries you get. Just make sure your public posts are tagged / hashtaged accordingly so that each entry is counted. Good luck you stamp loving person! I look forward to spending an afternoon of stamp making with you!